Welcome to one of the most popular children's entertainers and kids magicians in Stourbridge. Suppling great comedy magic shows, face painting with Karla, balloon animals, party games, prizes, disco's, lights, bubble machines, Charlie and Max, Andy's hilarious, crazy, loveable puppets and loads of fun and laughter. 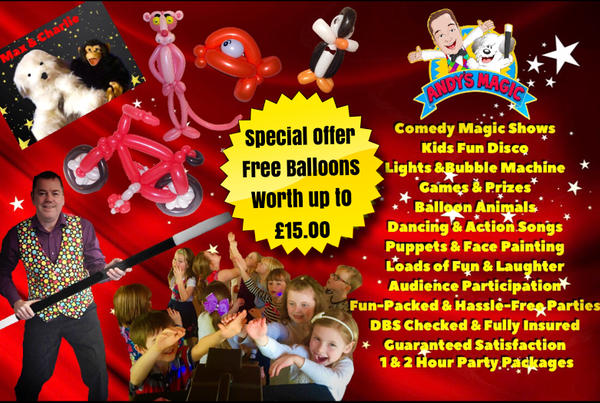 Your party entertainment in Stourbridge is in great hands with Andy's Magic the children's entertainer with great birthday party ideas and solutions for birthday and Christmas parties, schools, nurseries, fun-days, holiday and theme parks. Call children's entertainer and magician Andy now for your party in Stourbridge.